Altenew May Release Blog Hop! I am so excited to be part of Altenew release this month. This release is fabulous I tell you. So make sure you have a pen and paper to write down your wish list. Welcome to the Altenew Blog Hop! If you are hopping, you should have come from the talented Chari Moss‘s blog. If this is your first stop, then don’t worry. I have the full list of all the designers participating in the blog hop towards the end of the post. My projects today features Starry Flowers stamp set and Coordinating dies. Love the dainty delicate looking cluster images. So pretty. But I also love that some sentiments are bold and some are not. Perfect to combine them. Here is my first project using this set. ON this card, I stamped both the images on top of the panel flowing down. I used Altenew’s permanent black ink to stamp the images on Neenah Solar white 80 pound card panel. Then I used Altenew’s Artist Marker pen to colour the images. I used feathering technique to colour the flowers leaving large highlights. I also went around the image with a grey marker to add drop shadow. Then I simply stamped the sentiment from the same stamp set on the bottom right of the panel using Altenew permanent black ink. I adhered the panel to white card base using foam adhesives and embellished with clear droplets. I will link all the supplies used to make this card towards the end of the post. On my second card, I coloured the floral cluster images using yellow artist marker pens and die cut them using the coordinating dies. I arranged them diagonally opposite on a white card panel and adhered them using foam adhesives to get dimension.I added glossy accents to the centre of the flowers for texture and more dimension. The sentiment is from an older stamp set called Heartfelt Sentiments. I white heat embossed it on strips of black cardstock and adhered them on the top right and bottom left using foam adhesives again. This panel is then adhered on a white card base again using foam adhesive and embellished with clear droplets. Some closeups of the card. The colouring here again is just feathering leaving a lot of white highlights. I am loving this kind of colouring especially for delicate smaller floral images. Here are all the supplies I used on both the cards. I am also giving away one $30 gift certificate to Altenew store from my blog. Make sure you leave a comment on my post by 5/26/2018. I will randomly select one person and announce the winner on Wednesday 30th of May. You next stop is Altenew Scrapbook Blog. Happy Hopping and get inspired. Those flowers are so delicate and light looking. Beautiful creations with the new release. Thanks for sharing your inspiration. Both cards are beautiful! That’s a wonderful new stamp. Thanks for sharing you process and talent. 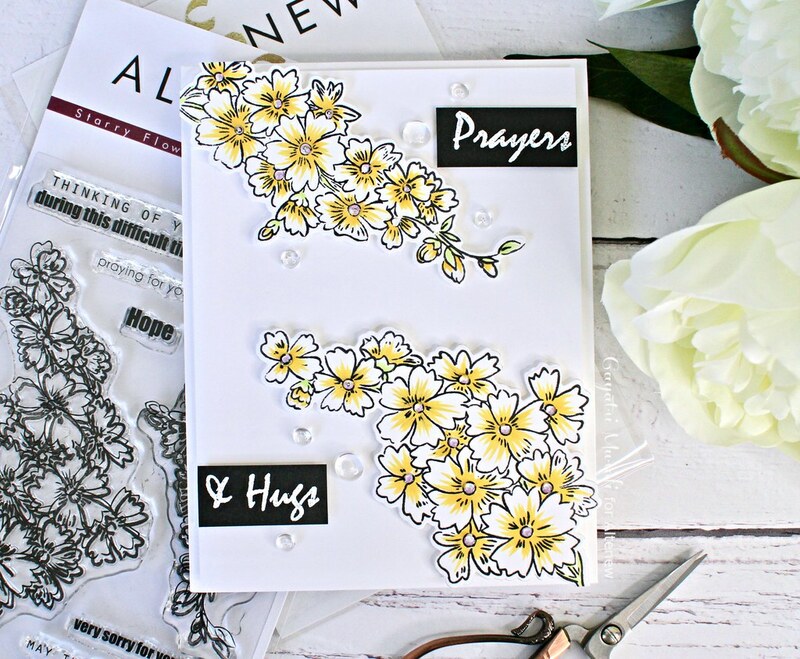 BEAUTIFUL encouragement cards… I need to make more of these to have on hand in my stash. Oh, these are beautiful! Love them! Lovely cards in beautiful colours. Thank you for sharing your designs. very long wish list! lol You make it look so easy to color them. 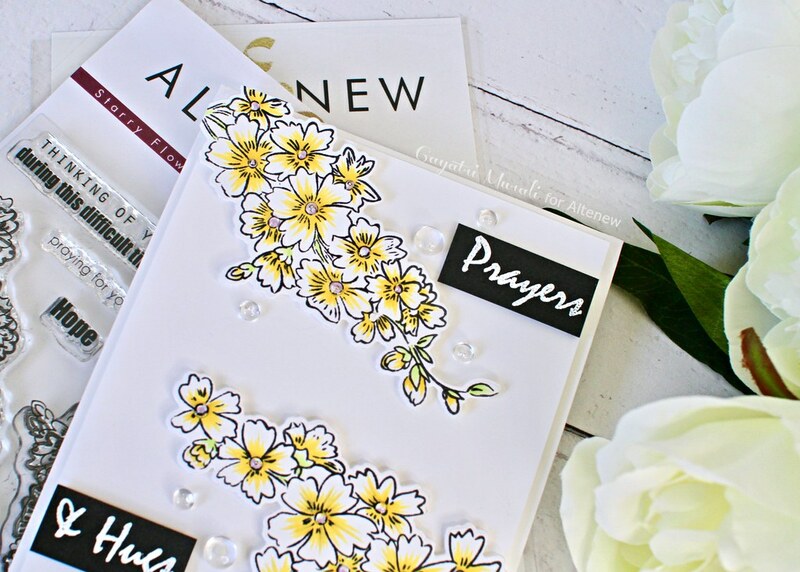 Beautiful encouragement cards! Love this set! Both cards are so pretty!! I like the simplistic beauty of your cards. I really love this new stamp set, it is so versatile! So delicate ; clean card…just enough. Just love all the items on the new release. Very nice card and inspiration! Beautiful cards! Thank you for the inspiration. Beautiful yet simple cards. love them! What a versatile stamp set, that is! I love it! adding just a little color makes them so beautifeul! Oh how sweet your beautiful cards are! Love the sweet look of how you arranged them and those tender sentiments! Am so taken with this set due to the versatility of using it as you have as well as a background image! Love how you made the flowers at different heights too!! Love it! Very pretty cards! Love the new release from Altenew and you have used some of their products is beautiful ways. I love the look you got with two different colors. Beautiful cards! The starry flowers are beautiful, and I really like the font combination of the Thinking of You. Your cards are beautiful and will bring great confort to the persons who will receive them. Great cards and lovely flower stamps …Thanks for inspiration. These stamps create delicate looking cards. Beautiful made! The starry flowers are really pretty. I can see being able to do them with many different colors. I love your cards they’re really pretty! Very nice and delicate. reminiscent of cherry blossoms in feel. Really pretty – love the delicateness of your color choices! Gorgeous cards! i love that stamp set, it’s so pretty! Thanks for the inspiration! You chose to make cards with my favorite stamp this month. I love those lovely flowers. These cards are gorgeous. This is a great release. Awesome release! Love the colors you picked for the flowers. 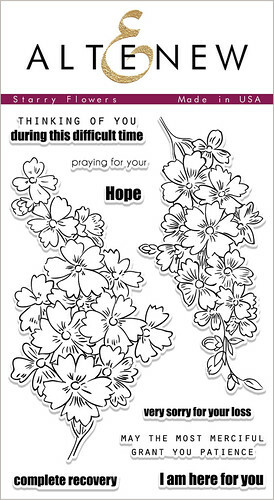 These are so beautiful and they are just perfect for sympathy cards. Both cards are so very pretty; simple elegance. I pinned them both for future reference. Your cards are beautiful and simple! I like that! Gorgeous cards Gayatri. Love the starry flowers. Such a pretty cluster of blooms. Love both designs. Great cards! Love the arrangement of the 1st card – so clean beautiful. Thanks for sharing. Such a pretty floral set. I love the different looks, especially the pink. Beautiful cards. The flowers look so delicate. Thanks for sharing!! Love how delicate the starry flowers are!! Great new set! :Lovely! Those starry flowers are one of my favorites from this release! These are so pretty and feminine! Thanks for the inspirations. So simple yet so beautiful! 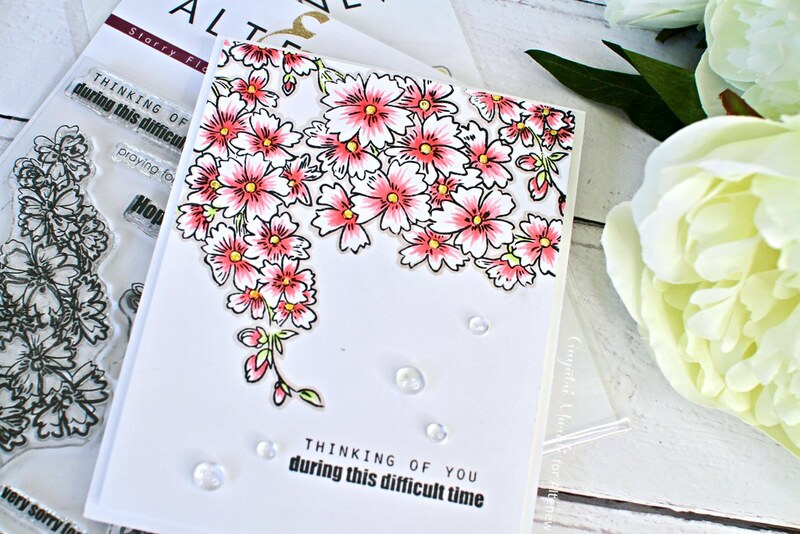 The pink Starry Flowers card is a stunner! Simple but elegant….speaks volumes! Thanks for sharing your talents. What wonderful cards. This floral image is so versatile and I’m glad you showed a couple of different ways to incorporate it. Nice job on these cards. They are lovely and delicate. Thanks for sharing. Lovely cards! The petite florals are so sweet, and I really like the coloring technique you used for them. The yellow is especially pretty with the black outline and bold sentiment! Two beautiful cards! Love your coloring of the flowers and the lovely designs. Hi Gayatri, Love that new starry flower set, I like your cards made with this set, TFS, Cheers Anna. My favorite stamp set of the release….both cards are simply amazing! Love this stamp set so much!!!! You really have showcased it so lovingly! I HAD to see all of the inspiration with these amazing NEW products!! So great to have taken part as a guest with you on this Release! Great cards and I love the small delicate florals and I agree wth you the sentiments are great. Beautiful job and I I’ve the colors you chose for both cards. Gorgeous cards! Love how you colored the florals and beautiful compositions. Beautiful cards, love how the different colors make the flowers look unique. I love when you can get different looks from the same stamp. And I think the grey marker adds just the right touch on the first card. beautiful cards – love this stamps set!!! I really wasn’t expecting to like the starry flowers stamp set. And it’s now my #1 choice. Isn’t it funny how that works out sometimes?! Thank you for sharing your beautiful ideas! Such beautiful cards. Love the flower stamp. Your placement of the starry flowers on both of these cards is impeccable! SO clean, crisp and fresh! They’re gorgeous 🙂 Thanks for sharing with us! I never thought to place these stamps as you have done. Thank you for the inspiration! Such a sweet flower set – beautiful work, as always, Gayatri! Thanks for the inspiration, really like the starry flower stamp set. These cards are so soft and beautiful! Thanks for sharing! This is gorgeous. Love the delicate feel here. Oh Gayatri, how stunning are these cards? Oh my goodness these flowers are delicate and perfectly coloured, just stunning! Very beautifully done. So pretty – love the flowers. 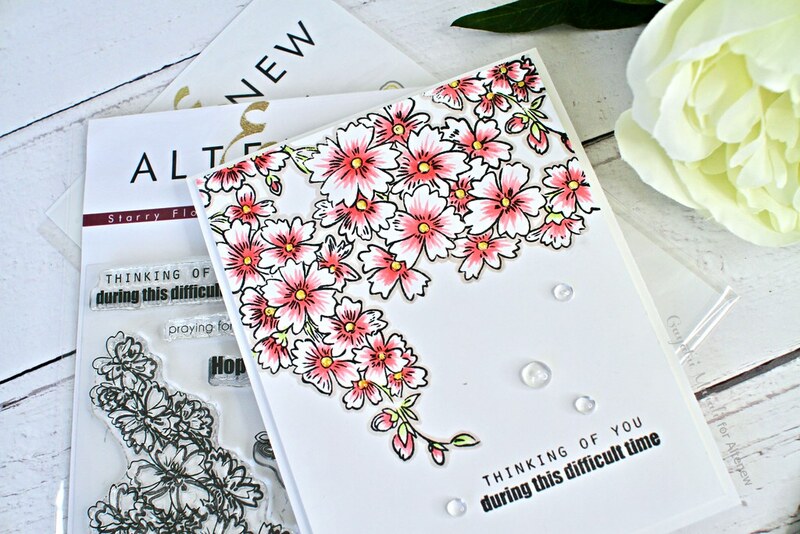 Beautiful floral cards—your coloring is so delicate. I didn’t care much for this set until I saw your cards. What a pretty stamp set. And I love both of your cards using it. The way you created a soft shadow around the flowers on the first card makes it look like it was embossed. So lovely. You have really showcased these stamps beautifully. You cards are so pretty and elegant. I LOVE your pretty cards! I love how you have created such beautiful dimension by making the flowers yellow and white, or pink and white. They are all really gorgeous! Wow! Beautiful cards, i love they way you make the flowers casecade form the top, very nice! this floral stamp is the best in the set! So simple. I love the soft coloring. These are beautiful cards that you have made. It has got me thinking about the need to buy this stamp set! Thank you. 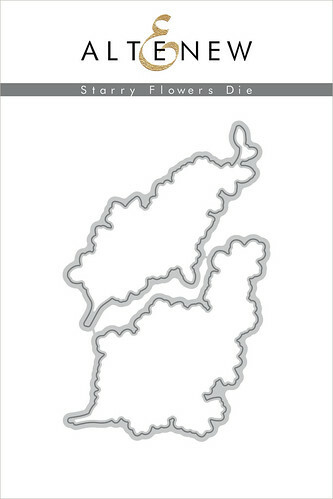 LOVE these pretty cards, the layouts for the starry flowers bouquets are awesome. Lovely cards! The Starry Flowers are a favorite! So pretty and joyful cards! What lovely coloring you did on these flowers. I guess it doesn’t take as much shading as I thought to make each bud stand out! I also really like seeing the different ways of laying out these bouquets. Thanks for such a helpful post! Love the pops of color on your cards. Thanks for sharing. I love this stamp and the fact that they made a matching die makes this a must have set. Thanks for sharing. Wow, I love that you can make a simple, elegant card with this set. Sure to be an instant classic! So soft and pretty. Simply wonderful cards showcasing the new stamps & dies beautifully. Beautiful cards. Love those delicate flowers. Gorgeous cards. I love the Starry Flowers set – think it may be my favorite from this release. Beautiful cards!! your coloring is AMAZING!!! Gayatri, these are beautiful cards. Love the different color combinations. Two great Starry Flower Cards! I like that you made the flowers softer and let the sentiments speak for themselves. Lovely cards! Love how you coloured the flowers! Such beautiful cards! The Starry Flowers is a must have for me! Beautiful cards. I love how you colored the flowers. Very crisp and clean. Wow I love the way you used this stamp set, so inspiring! Very pretty–I like how you colored the flowers. Beautiful cards! I love the soft colors and the sentiments are perfect. Thanks for sharing! Wow you did such an amazing job with these starry flowers set! How sweet and simple these are! Thank you for the inspiration! Love the pink one. 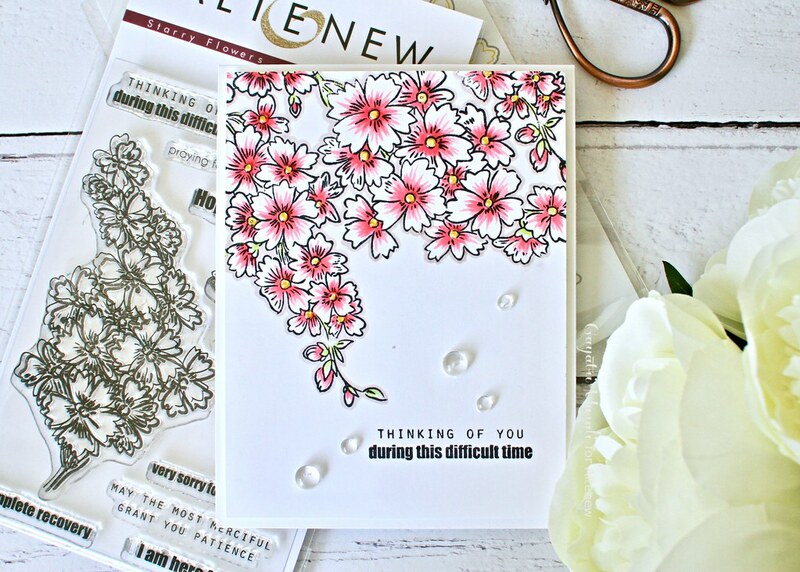 This Starry flower stamp set is so pretty and dainty- perfect for someone going through a difficult time. You really brought the beauty out of these flowers in your cards- such sweet, peaceful cards. This Starry flower stamp set is so pretty and dainty- perfect for someone going through a difficult time. 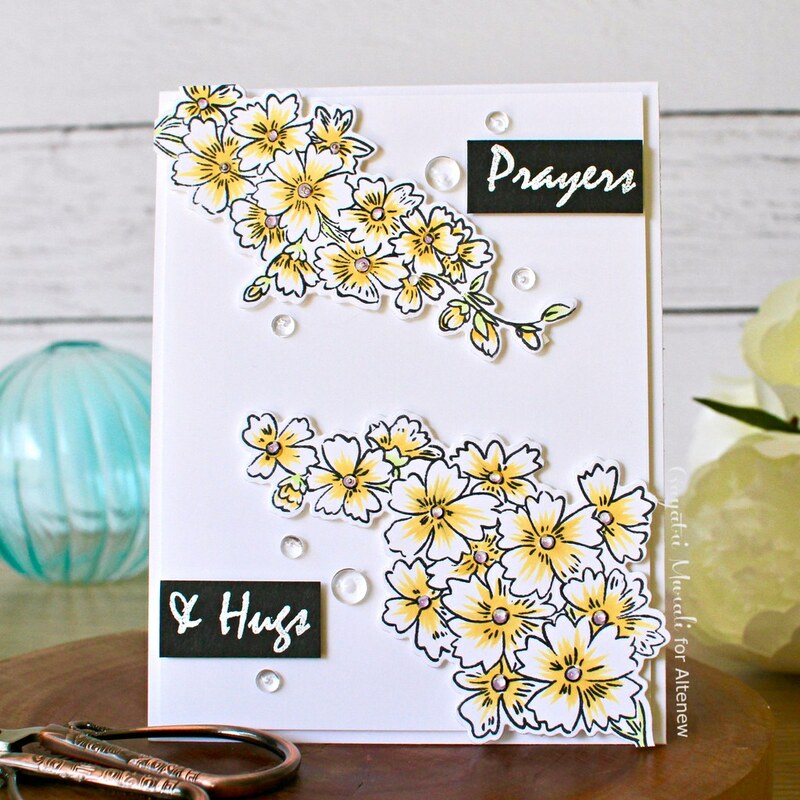 You really brought the beauty out of these flowers in your cards- such sweet and peaceful designs. I love your beautiful Starry Flowers cards, Gayatri! 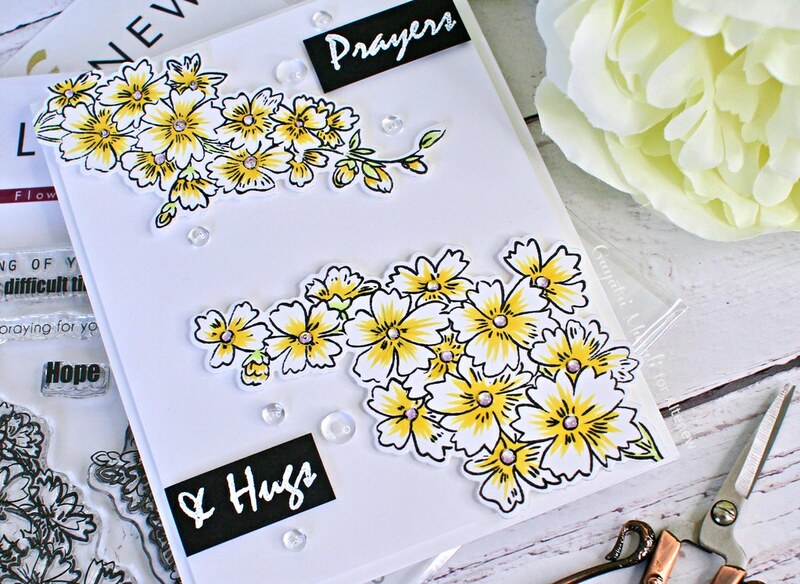 I also loved how one card shows the flowers stamped directly onto the card and one card shows the flowers die cut with foam adhesive to pop them up. Both techniques look really gorgeous! Thanks for the great ideas!